I’ve been looking forward to this trip for some time. 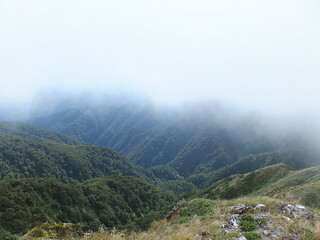 The basic plan will be to follow the Tararua Main Range between Bridge Peak and Shoulder Knob, via the Tararua Peaks, looping from Otaki Forks, and for me it includes some red line. We’re hoping to be at Kime Hut tonight, but we can stop at Field if it works out that way. After a stop at Waikanae (where I grab some fish & chips for tea), our tramping club van-load arrives at the Otaki Forks overnight car-park shortly before 8pm, after which I’m the first to hop down to the Waiotauru River as I’m keen to fill up on some water for the walk up the hill. I take my time and slowly random people show up and walk across the bridge. Not wanting to lose track of those in my own group, I wait until I’ve seen everyone. Dates: 21st – 23rd March, 2014. People: Alistair, Shay, Andy and me. 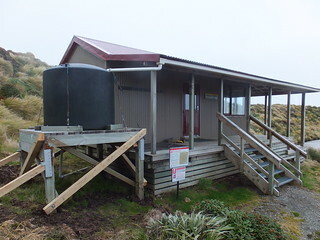 Huts visited: Field Hut (1 night), Maungahuka Hut (0 nights), Anderson Memorial hut (1 night), Waitewaewae Hut (0 nights). Route: Field on Friday night. 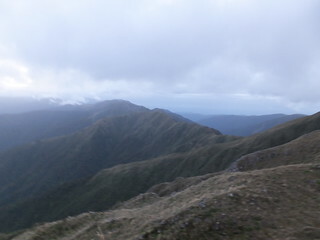 Then over Tararua Peaks to Maungahuka and Andersons Memorial Hut on Saturday. 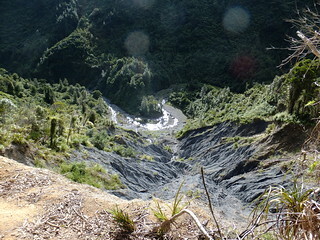 Then back to Otaki Forks via Waitewaewae on Sunday. Also see: Alistair also wrote a report for the WTMC newsletter. Shay emerges from the darkness, very suddenly, and races past me, and suddenly I’m playing catch-up, thinking that maybe it wasn’t such a good idea to wait. In the dusk it’s already unclear who’s who, and with several groups of people all seeming to be walking up to Field, besides just the other group from our club, all I think I’m sure of is that everyone with me is somewhere in front. Of more concern though is that I’m weirdly having trouble keeping up. I finally catch up and manage to get Alistair to stop for a moment while I try to recover. It’s about 8.30pm, 10 to 15 minutes after crossing the bridge, and having climbed only about 150 metres we’re still within sight of the forks! I start again but it’s much harder than it should be. To top it off, Alistair points out that “we’re not going fast”. This is bad. Mediocre story short, my fish and chips don’t make it all the way up the hill. I feel quite a lot better after that but it creates new issues which I don’t feel too great about. For one thing, I really don’t think I can get beyond Field tonight (and I hate to hold up everyone else), plus I really don’t know how I’ll fare tomorrow, which should be a big day, on an empty stomach. We’ve lost Andy and Shay up ahead somewhere, but Alistair and I more or less decide that if I’m struggling tomorrow morning, I’ll just stop at Kime and return later to the forks by myself, to eventually meet them. We overtake another couple, also aiming for Field, on the way up, and as we roll in at 10.10pm we’re glad to find that Andy and Shay have stopped to wait. They’re politely alright with going no further this evening. For me it’s not been the most rapid hop up to Field in history but I think I could have managed worse than 2 hours under the circumstances, so not too bad. Two hunters are also there, sleeping downstairs, and from what we’ve seen downstairs we’re expecting many more. I drag a mattress to under the bench and set up. Meanwhile the Southern Crossing group, who shared our van, wander in, as well as splatterings of others who I can’t identify. I drift off to sleep under the bench. Alistair at dawn, near Dennan. Someone’s up at 5.20am, and thinking it’s Alistair I gather some of my things and sneak outside onto the deck. It’s only after I’m committed to this that I realise it’s the two hunters, so we have a bit of a natter. It sounds as if a large group of scouts were planning to spend last night at Kime, so maybe it’s a fortunate thing that we didn’t aim for that hut in the end. We’re eventually away at 6.03am on Saturday morning, heading further up the hill. It’s still dark at this time of morning. I’m feeling much better, albeit concerned about the whole empty stomach thing and how it might manifest itself. As we circumvent Dennan the back-light gradually makes itself apparent, and it’s notably light by the time we hit Bridge Peak, to veer off along the Main Range, at about 7.30am. We wade through the knee-high tussock across Bridge Peak, generally east-ish, waiting until the network of vague ground trails all converge into a discernible ad-hoc track along the ground. It doesn’t even cross my mind that I’m abandoning the possibility of a bailed out weekend at Kime, and instead committing to a long Saturday. Hopefully this means I’m fine for it. 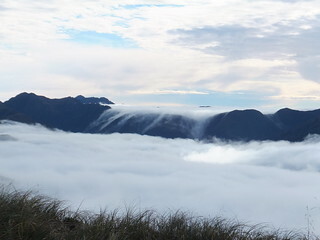 Behind us, the tops towards the south and the Southern Crossing are clagged in, but visibility is sufficient in front. It’s not a horizon of brilliant clarity by any stretch, but we’re also not walking through clouds which block all vision. There’s a naggingly constant 40-50km/h wind from the south-east, however, which isn’t letting up. That’s mildly irritating, but it’s certainly not strong enough to be a hindrance and nor is it gusting any higher. It’s not forecast to change until tomorrow afternoon, by which time with everything going well, we’ll be downstairs in Waitewaewae. the first descent towards Boyd Wilson Knob. Down towards the right is a smooth gully which flows into the catchment of the Hector River (here’s a Google-Earth like view, just for fun). 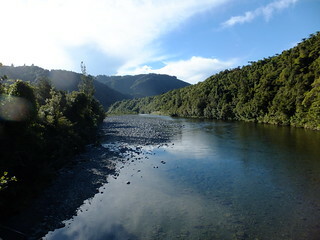 The catchment was once labelled as the upper reaches of the Waiohine River until the official names were juggled around many decades ago, and so what’s now known as the Hector River now joins the official Waiohine further down. Shay and Andy lead the way, which is set to be the theme for the day because they’re both bouncing bundles of energy. Before we began Alistair had declared he’d be the weakest link in our group, but I’m now giving him a run for his money. All that said I’m actually not feeling too bad just yet, but as time goes on I’m starting to notice that I’m low on energy, and that the whole action of placing my feet and pushing forwards is becoming more of a chore than usual. It probably would have made a big difference if I’d had last night’s dinner to work with. 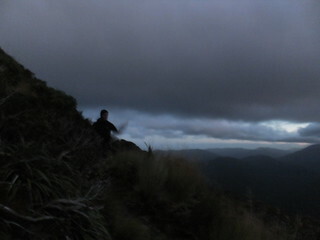 Alistair, searching behind us, spots a couple of figures tailing us from Bridge Peak. Aside from the hunters, we’re not aware of anyone who was at Field and meaning to come our way, so they’ve probably come from the Kime direction. Maybe we’ll meet them later in the day. We stop for a snack somewhere below Yeates, looking up the left-curving up-hill ridge towards McIntosh. Alistair nearing the top of McIntosh (.1286), with much of the Southern Crossing in clag behind. I completely miss the marked track down Pakihori Ridge. I hope that I normally wouldn’t look through what should be such a significant junction, but I’m really feeling under the weather right now, and the Main Range, at least, seems obvious enough. At any point in time I seem to be the only one of us who even cares to consider where we are, but the conditions aren’t bad enough for it to really be an issue. 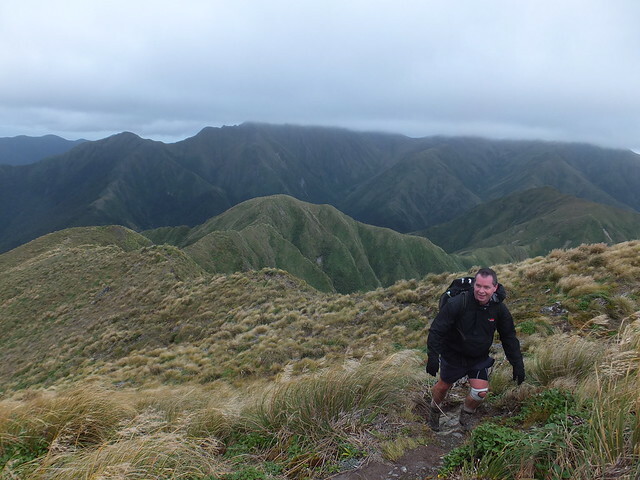 Andy waits before approaching Tuiti and Tunui, AKA the Tararua Peaks. 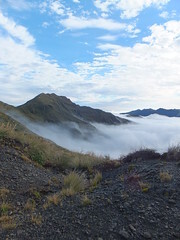 We stop, briefly, again before the Tararua Peaks, which is a feature I’ve been uncertain of whether to look forward to or not. Then press on. I’d always known about the ladder, but hadn’t realised there’s a certain amount of steep clambering on both sides of it, around both Tuiti and Tunui. Nothing too unnerving on the scale of nerviness as encountered in the hills, but with attention required and not something to do without a head for heights. It’s probably also not a great thing to be attempting in aggressive weather. On both sides of the ladder, there are now chains in place to assist with the worst parts, which you might or mightn’t decide to use. We make it through all this region and continue another 500 metres, where I look up to the top of the ridge on the right, seeing a DOC sign which I’d presume is pointing down to Neil Forks Hut, but at this point I just can’t be bothered going to check. Maungahuka awaits, and I’m feeling tired. 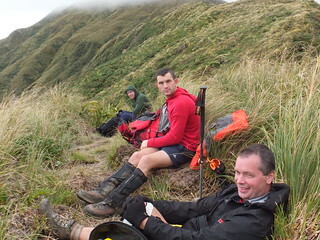 We’ve been going since 6am, and at 11.15am we finally reach Maungahuka Hut for a lunch stop. Nobody’s home. We enter and sit down, getting a brew going, and I toy with the idea of lying down for a few minutes, getting as far as pulling down one of the mattresses. It’s very cold, though. Need food. If we were here for any length of time then I think I’d have a sleeping bag out. Alistair offers me some soup. Hmm, Ox Tail soup? I’ve never had that one, but it’s a soup that sounds like good solid meaty food, so I’ll give it a try. Before I lie down at all, two new arrivals enter the hut. They’re the chaps who have been following us all day, now arrived from Kime. We have a good chat with them, slurping some soup after the tea. Soon enough after this, another arrival opens the door, turning out to be Matthew Briggs arrived from Anderson’s Hut (tonight’s destination), who’s most of the way through a lengthy project to walk from the East cape down to the southern end of the Rimutakas. Heh. Somehow it seems mildly amusing that three independent groups of people beginning from different places could all coincidentally converge on a relatively remote location such as Maungahuka Hut within about a 10 minute window of time. I never really get to lie down. There are too many interesting conversations going on, even if I’m not in a state to be a very vocal participant. No matter. I’m not sure I’ve ever been in a place with this level of remoteness where three different groups of people have converged for lunch. 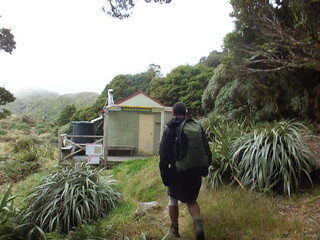 We finally stand and leave Maungahuka Hut, about 12.30pm and more than an hour after we arrived. Matthew (who’s come from Andersons) decides he’ll drop down to Neill Forks, rather than risk being crowded out at Kime, especially after hearing the stories of how busy it was on Friday night. The other two chaps stay around for longer, but they’ll be following us. It’s cold outside, but not for long after we’ve started moving again. We cease briefly on Simpson (.1138) after 20 minutes, and cross Wright (.1196) just over an hour after leaving, at about 1.40pm. The wind is still constant enough to be annoying, but not gusting highly or in any way overbearing. 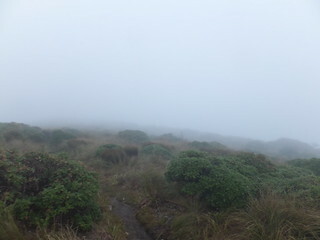 Visibility is good, at least in our immediate vicinity on the range and despite the clag over the range to the south, behind us. Somewhere along the way, but I forget exactly where, we meet a group of 3 people with whom Matthew had shared Andersons the night before, and we stop and yak for 5 minutes. They sound as if they’ll aim for Kime. The route from this point on is fairly straightforward, but I’m really starting to notice the lack of energy by now. 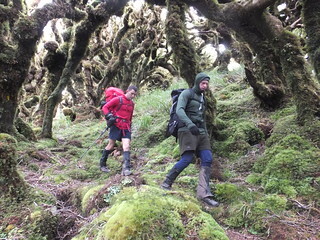 While Andy and Shay are happily hopping ahead, I’m finding myself taking increasingly regular breaks, playing some kind of start-stop game with Alistair on the way up towards Aokaparangi (.1354). 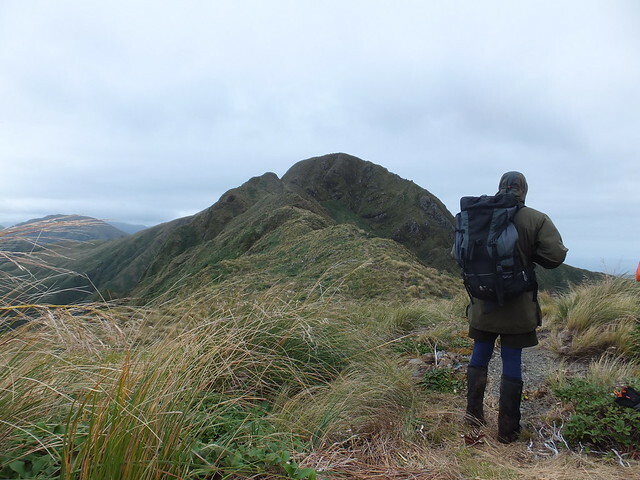 I think I have a new-found respect for people who spend time on the Tararua tops with an empty stomach, and it’s not something I’d repeat intentionally. While I’m having my own problems, Alistair’s getting cramp issues. I offer him some sour snakes, which he decides actually seem to be working against his cramo. Placebo or not, he gleefully raids my supply a few more times throughout the afternoon. I’m really not used to being the weakest link in a group, and I think that’s something I’m finding harder than simply going slowly because I can tell from the time and the Sun that there’s no urgent rush and that I’m fine to actually get there. It’s just tough knowing that people might be waiting. 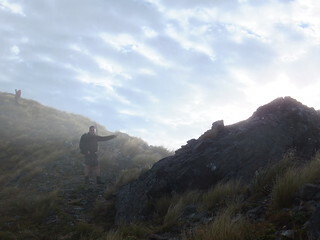 At about 2.55pm we re-group at the sign-post pointing towards Aokaparangi Hut, and cross the top of Aokaparangi about 5 minutes later. 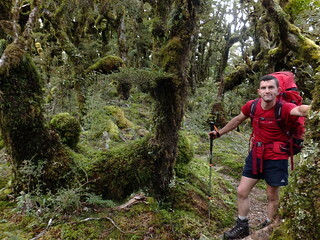 The range dips into one final undulation, to Kahiwiroa (.1320) which we crossed at about 4.30pm, and around 5pm we finally drop into trees for the 30 minutes prior to reaching Anderson Memorial Hut. Nobody’s home, which is helpful because with the other two chaps on their way we’re probably expecting at least 6 people tonight. Andersons is a standard, 6-bunk hut. There’s a small deck under shelter out front, with about enough space for one person to sleep. For a while I’m tempted, but it looks too compact and crammed in with other facilities like the water tank. With that many people around and I figure in the end to sleep inside. The other chaps from Kime turn up and happily take the extra two bunks. They also helpfully loan us some cooking gas after we discover that we’ve mis-calculated (thanks guys!). Alistair rapidly throws together a nice pasta dinner. Maybe it’s the ongoing lack of energy but I find it to be very cold outside this evening. I’m really appreciating everyone else chipping in and doing dishes and cleaning up for the most part. I don’t have such a great sleep, but it’s at least good to have eaten. When we begin to stir on Sunday morning, a quick check outside reveals that we’re still clagged in, but some type of light is at least refracting through the cloud and conditions are otherwise calm. That persistent wind which we’d had yesterday seems to be gone, for now. Everything is still. 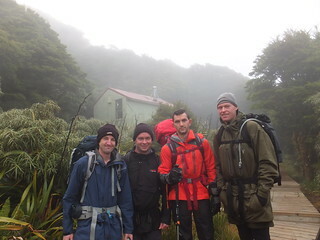 Me, Alistair, Shay and Andy, just prior to leaving in muted colours on Sunday morning. The four of us are away at about 8am, soon overtaking the other two guys who’d left slightly before us. I do enjoy these muted alpine environments. It’s quiet, but with enough patience the surrounding flora and fauna starts to become more apparent. We follow the marked route as it part climbs, part sidles and loosely winds its way up the contours towards .1365, the base of which seems to have been roped off by someone (though we ignore it). At 8.30am, I glance ahead and notice that Alistair is suddenly gawking at everything around him in excitement. Because, just below .1356, everything has suddenly opened up. We’ve reached a critical elevation between layers of air. 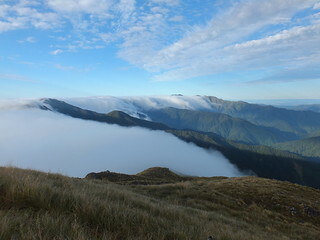 All of a sudden, the sky above us is a brilliant blue, and looking horizontally we see a dynamic, flowing wispy blanket of white which sits below the tops, filling the valleys between all major parts of the Tararua Range. Crawford (.1462) looms above us to the north, but we can easily see straight into the range as it extends into the likes of Dundas, back towards the heights of Bannister and Girdlestone, then Holdsworth further south. To the north west, we have clear views of Eggie. It’s easily worth a 20 minute stop. The other two guys, with whom we shared last night’s accommodation, turn up and we all briefly exchange cameras. 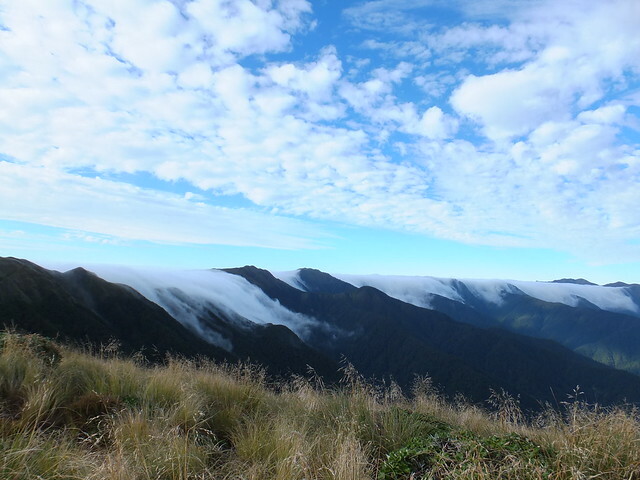 This type of scenery is not an easy thing to get in the Tararuas. It’s not just the scenery which is the highlight of the weekend, though. It’s everything we’ve so-far been to to reach it. Eventually, we continue to Junction Knob (.1375) where we wait for another 10 minutes, taking another look at the surroundings. The other two guys have left their packs and headed up to bag Crawford, but with our own group of four we leave again at 9.17am. 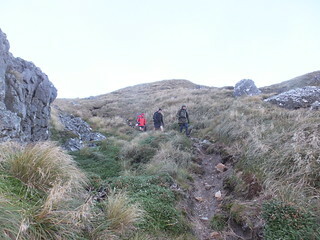 A final, slow trudge towards Shoulder Knob at which point we’ll leave the alpine tops on a steep drop down towards Waitewaewae Hut. Shay on the way down. Our descent, beginning just before 10am, is relatively uneventful except for a few lengthy stops for random banter. I’m feeling really good now, especially compared with yesterday. Getting down Alistair’s meal last night seems to have done the trick. Apparently at least one knee in our group isn’t behaving, though, so going down-hill is taking some time. In the end, we spend 90 minutes for the 900 metre vertical descent. Averaging 10 metres every minute doesn’t seem too bad considering the lengths of time we also spent going nowhere. At the swing bridge, there’s a helicopter playing at a distance on the river flats but we can’t see what they’re doing. It’s probably hunting related. 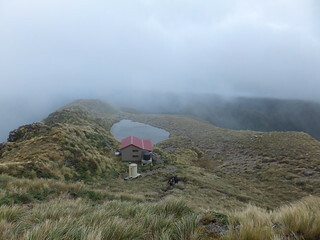 At 11.50am, we arrive at Waitewaewae Hut. The stove’s still warm from whoever was here this morning, but other than this sign there’s nobody at home, nor any sign that anyone’s inhabiting the place right now. The other two chaps turn up and loan us more cooking gas for a brew (thanks guys!). We sit in the sun, and do nothing of consequence. The Otaki River outside Waitewaewae. Until 1.30pm, that is. 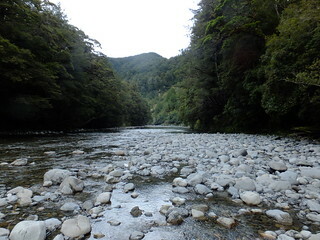 Alistair’s only ever been out of Waitewaewae via the high-water track, and he’s keen for me to show him the river way out, which is much faster and easier as long as the Otaki River is in low flow (and it is). I haven’t been here for a few years, but Arapito Creek’s entrance into the Otaki is easy to spot, and is even marked with a big orange triangle. 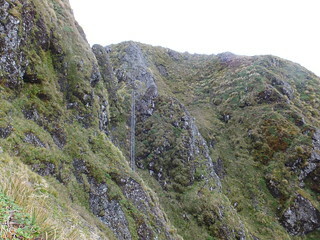 Once walking up that creek, ground trails make it easy to locate the main Waitewaewae Track back towards Otaki Forks. We trade places several times with the other two chaps, also headed back to the Forks, reaching the plateau (just below .530) at about 2.40pm, and (after a lengthy 20 minute stop) the log-hauler down the far end of Saddle Creek at about 4pm. Leaving the log hauler at 4.15pm, we begin the final railway sidle. The active slips along here have become decidedly worse since my previous visit. On one occasion we’re forced out to the exposed area quite near the top of the active slip. In another, an old part of the track is still actively fenced with a small detour up the hill. None of this is really much worse than some of what we encountered yesterday bit it’s clear that this track is not presently in a state that’s ideal for some of the people who often like to walk it. The old log-hauling railway route makes a nice, smooth-gradient walk for the most part, but I do wonder just how much of this severe erosion is a direct consequence of the logging operations which occurred during the earlier parts of the 20th century. The engine that’s now located at the end of Saddle Creek was most probably used to drag many of the ancient trees whose roots held together this very spot, and over the decades that followed we’re gradually seeing the entire hill-side erode away. It’s another chapter in history, I suppose, and we’ll live with it because it’s what happened. After substantial laziness we’re finally re-grouping at the bridge over the Otaki River at 5.20pm, and it’s not until 5.45pm that we leave the bridge for the final leg, reaching the Otaki Forks carpark at around 6pm. I’m glad I’ve made it through this weekend. Crazy people who like wearing tiny hydration packs run this route with a sandwich in their hand in a day, but I find a good solid weekend with a more sizeable backpack works better for me. It’s a very rewarding experience when it all fits together. I hope it won’t be too long before I’m able to return again. Here’s one more for the road, just as we dropped off Shoulder Knob. Cool, thanks for that insight. It wouldn’t have crossed my mind. 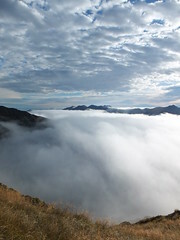 stopped in otaki for fish and chips… then headed up thei hill… one hot summers evening. got to the end of the first climb up fields track and just slumped down and lay on the ground for a while feeling like we had cement in our stomach… lesson learned about fish and chips before a big hill climb!